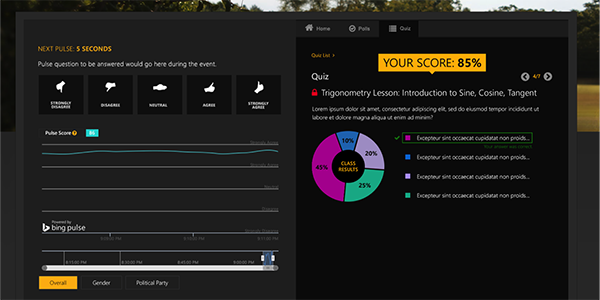 Bing Pulse in the Classroom, a new student response system designed for higher education, launched this week. A new student response tool designed by a team at Microsoft will soon be giving teachers instant feedback on how their lessons are going. Bing Pulse in the Classroom, a free online tool designed to make higher education lectures more dynamic, was released Thursday. The technology lets teachers ask students questions to get a real-time "pulse" of the lesson to ensure a teacher isn't getting too far ahead of the class. The backbone of the platform, Bing Pulse, was first launched in 2013 as an audience response platform and Bing Pulse 2.0, the self-service platform, was released in December 2014. Soon afterward, it was used by both MSNBC and CNN during the 2015 State of the Union address. At peak volume, Pulse gathered more than 13 million responses in less than 45 minutes, says the product leader for Bing Pulse, Dritan Nesho. Nesho tells EdTech that they've had a classroom application for Pulse in the back of their mind throughout the product’s development. “We felt if the technology were repurposed for this particular environment, it could be both empowering for teachers — letting them adjust the pace and style of learning to their students — while also helping students become more engaged in the lessons,” says Nesho. When teachers start using Pulse, they’ll need to provide class details, class profiles and poll questions. This will help determine what the range and scale of the voting will be. When you make your class live, you are given a URL for students to interact with Pulse. Rather than replace a classroom environment, tools like these augment lessons in progress with student feedback. Such real-time feedback opens the door to personalized learning, in which a teacher can shape a class to suit students’ needs. That’s what Nesho said interested him and his team during the product’s development. “We’ve created a Swiss Army knife that teachers can use as they see fit,” he says. A feature not included in Pulse in the Classroom’s first iteration was live video streaming. Nesho says this capability will soon be added, and it could be a game changer for higher education classes that incorporate distance learning. Using a live video stream along with the Pulse feature set, the platform comes closer to an all-inclusive classroom experience. “Once we have both the video and a full integration with Office 365, it will be very possible for a teacher to run a class simply by sending students a link to the Pulse page,” Nesho says. Student response systems (SRS) aren't new to education. Large- and small-scale SRS solutions have been around for years, including popular choices such as Socrative and Top Hat, and they’ve been evolving along with the needs of educators. Nesho says Pulse in the Classroom distinguishes itself from other SRS through the platform’s speed — promising feedback with no lag — and its ability to operate on any web browser and any device. The team is also receptive to incorporating feedback from educators after the product’s launch. While this iteration of Pulse in the Classroom is geared to higher education, Nesho says they’re already considering how it will fit into the K–12 space. Teachers can try Pulse in the Classroom for free.